Once again, ignorance strikes in Lebanon. Marjane Satrapi’s Persepolis is the latest victim of our very “intellectual” General Security Censorship Department. I first discovered Persepolis in Beirut, when I came across the series of comic books on which the movie is based. Reading Persepolis was an amazing experience; I can easily label it as “Iran’s modern history for dummies”. Watching the movie was even better, for it operates on several levels. On one level it is a very simple and accessible piece of work that even a child can watch and enjoy. It is a highly emotional autobiography that tells the simple story of an Iranian girl growing up in the last years of the Pahlawi’s dynasty in Iran. She witnesses the rise of the Islamic Republic after 1979 and the implementation of the strict Islamic social and cultural code of conduct. On another level It can be viewed as a very complex work focusing on how psychologically painful the experience of a teenager who is sent to live alone in a country with a very different culture (in 1983, at the age of 14, Satrapi was sent to Austria, by her parents in order to flee the Iranian regime). The most sophisticated part of the movie is the historical and political angle through which Satrapi tells a vastly ignored part of Iran’s History. Through the experience of her socialist and communist family, from intimidation to imprisonment and killing, she shows how the Iranian Islamic Regime established its legacy by anihilating the Left who was the real avant-garde of the social and political movement that ended the Shah’s reign. Banning Satrapi’s work in Iran may not be surprising, but banning it in Lebanon has a very different signification. I will not go into a political diatribe to convince my reader that Hezbollah is an Iranian proxy. But simply, this movie and comic books add to the debate about Hezbollah’s role and political ambitions the kind of argumentation the party wants to avoid because it ruins years of efforts to give the very fundamentalist party of god a “modern and tolerant” face. Those who know about Lebanese politics know for sure how powerful Hezbollah is in certain spheres of the Lebanese Administration, notably the General Security where the committee of censorship sits. The outright banning of Persepolis is an added clue to the true Hezbollah. But the lesson from the Film is elsewhere, it is for the emerging “Neo-Left” in Lebanon and the Arab World, who picture Hezbollah today as the natural heir to the socialist and nationalist liberation movements of the sixties and seventies. For those “leftists” engaged in a marketing and propaganda campaign on behalf of “the resistant Hezbollah-Damascus-Teheran-Caracas Axis” Persepolis sends a very clear message: Help the fundamentalists to power once again and you will be at the receiving end of their first bullit. 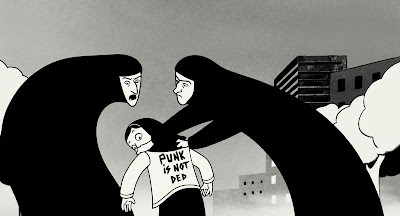 Persepolis won the Jury Prize of Cannes Film Festival (2007), and was nominated for an Academy Award for Best Animated Feature in January 2008. Wouldn't the same argument hold when Mohamad's cartoons were banned in Lebanon?, the Times special issue on Israel that was not released in Lebanon, and the banning of Dan Brown's The Da Vinci Code? Well, isn't the simple fact that there is a Committee for Censorship in Lebanon already a breach against democracy? No democratic country needs a Committee for Censorship. If a film, publication or any other type of expression mean is breaking the law, it should be banned and its author and/or publisher fined by a proper civil court. That's it. But of course, Lebanon is more a protectorate (again) than a true democracy. The analysis presented about Persepolis- both the film and the book series- is right on target. It is true work of art and of social engement. Everyone should see it. I am not so sure about some of other conclusions. Censorship of anything that any religious authority or party in Lebanon deems "touchy" or "offensive", has a long history. Every religious organization in Lebanon has the dubious honor of boasting at least one ban on its CV! In this instance what Hizbollah does is benefit from the mutant socio-political power structure we have to add its name to illustrious list of bans. Thus the real problem is much deeper than Hizbollah's political agenda. More importantly, I agree fully with sounding the alarm about the lesson all leftists should learn form what happened when the thugs of the Khomeini wing of the revolution brutally crushed the Iranian communist party, and eventually their own islamist allies. However, being aware of this does not mean that leftists should be ashamed of supporting the act of resistance. It is possible- indeed essential- to be both for resistance and against the political ideology of the party engaged in it. For in failing to recognize this nuance, we end up playing exactly into the hands of those- on all sides- who see the world as a clash of two absolutes, a vision so "eloquently articulated" by GWB when he said "you are either with us, or against us". As leftists our mission is not to play this game, but rather to change its rules- or, perhaps more likely, die trying! I think all 3 points made above are relevant in their own way. There is no doubt I agree with alphast but there is so much wrong with Lebanon on an elementary and societal level that having such a committee sounds normal within the context. It is just another way of regulating and preventing change. Regarding Marwan and Bassem's comments which I think argue similar points, it is true that hezbollah isnt unique (actually he might not be directly responsible for the banning) in ensuring that censorship is alive and kicking. Marwan's examples come handy here, the Maronite church deserving a special mention,but we need to address each one of these revolting cases of unjustiable censorship at every occasion without necessarly having to balance our views by reminding ourselves of previous bans. This method is paralysing at best and not needed among people who agree on basic principles of freedom of thought. Joe - I agree with your comments. I brought the issue regarding historic censurship as I felt the article the article was one sided at best. While the current role of Hezbollah in Lebanese politics is questionable at best, censurship is really not the topic where this group can be singled out. وسط كل علامات الخيبة، قد يكون لبنان خرج بحصاد واحد يتمثل في موت الرقابة. فلقد نجح وزير الثقافة طارق متري في كسر قرار المنع للمرة الثانية. المرة الأولى حين منع الأمن العام مسرحية ربيع مروة، والمرة الثانية حين طاول المنع فيلم "برسيبوليس". آن الاوان لتغيير قانون الرقابة، ورفع الرقابة نهائيا عن الأعمال الفنية، واخراج ضباط الأمن العام من دائرة القرار الثقافي. عندذاك فقط نبدأ بوضع مداميك لبنان الجديد التي تتلخص في مسألتين: رفع الرقابة عن الثقافة، كي تعود بيروت عاصمة للحرية، والبدء بتأسيس فكرة المواطنة العلمانية، عبر اقرار قانون للزواج المدني الاختياري، كخطوة اولى. عبر هاتين المسألتين نخرج من هذا الجدل السياسي الكاذب، الذي يغطي مشاريع الهيمنة المذهبية بالقضية الوطنية، ويقتل الاستقلال من اجل ان يطمئن النظام الاستبدادي الى مصيره. This comment is somewhat late. However, I wanted to share with you the above statement by Lebanese novelist Elias Khoury, editor in chief of "Al Mulhaq althaqafy" of Annahar newspaper, that he wrote on the margins of his article on the recent "Arab Summit" in Damascus. I felt it is quite relevant to Bachir's post and could spur further needed discussion on the subject of censorship and sectarianism in Lebanon. With a dose of healthy cynicism, one wonders whether Minister Mitry would be able to lift a censorship on a film that is to say critical of the Saudi Monarchal regime. Is this an act that is politically motivated and aimed at scoring political points in favor of one of the sectarian alliance against the other? Are the hopes of Elias Khoury of a "secular democracy" or "secular citizenship" as he termed it in his statement, wishful thinking at best in light of the marginalization and "self marginalization" of the "secular" political parties and groups whether "leftist" or otherwise? How can we even think about a "secular citizenship" when those who are supposed to uphold the ideals and program of a secular democracy have turned themselves into appendages of the sectarian agendas of March 8 and 14 and reduced their roles to mere "secular" fig leaves and apologists for either groups? Is Elias Khoury's hopes for changing the "laws of Censorship" possible under the permanence and deepening of the sectarian system? Why would those sectarian and religious leaders want to give up one of their potent tools that allows them to maintain and exert their influence and use it to claim and boast that they are the protectors and defenders of their respective religion and sect to perpetuate their legitimacy? When will Lebanon's secularists realize that they have more in common among than they have with March 8 or 14th? My skepticism aside, I can only salute novelist Elias Khoury for his ardent stance in defense of freedom of political, press, cultural and artistic expression in Lebanon and the Arab world. It is not the first time that he has written on and championed such fundamental human right. In this spirit, I would like to draw your attention to Forum that Khoury is organizing in Beirut on May 21 & 22under the auspices of the Samir Kassir Cultural Foundation that will address issues of censorship in the Arab world. I am sure that the papers presented on the subject by prominent researchers like Nasr Hamid Abu Ziad and others will futher deepen and enrich our discussion around this important subject. "How can we even think about a "secular citizenship" when those who are supposed to uphold the ideals and program of a secular democracy have turned themselves into appendages of the sectarian agendas of March 8 and 14 and reduced their roles to mere "secular" fig leaves and apologists for either groups? " Let's find a place for those who do not accept this equation. And they are many.